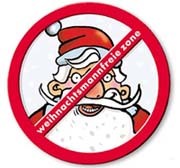 The Poor Mouth: Santa Raus! We have never had the Santa, and Hungarian children celebrate Christmas on the 24th of december. But the angel or little Jesus brings the gifts, (mostly the angel) never the Santa, here. And that hasn't changed. For Romanians is "Mosul", (the old man), that is closer to the Santa image. It it a small irritation but I would much rather to have our own xmas figures rather than the american version. On the other hand Santa is perfect for dyslexic devil worshippers! but even if there was no santa anymore...a british christmas would still be americanized. I guess I'm for seld determination for the Czech Rep. I certainly sympathise with the Czechs too, Ren! It will be americanized, Jam, whatever you do> for the traditional Christmases one needs a family, a community, and one sees only the santas on the TV, magazines...it will take over soon. It is very difficult to find a Christmas card with an angel for example. I must admit my christmas cards have a fairly predictable theme.. Hint I have four of them! That image is too much! We have trifle every Christmas (non-alcoholic, but made from scratch). We do not have Christmas pudding (shudder). Of course you can't Mullet.. You will be happy or it's prison for you. doesn look as if it will work! I know what you mean Elizabeth. SOme aspects of xmas are ancient but a lot of what we consider traditional are modern constructs. Us we will celebrate xmas in a low key manner, with the not wides family on xmas day and mine on Boxing day. Bah humbug - christmas is a time for profiteering. Khe, and the rest of the year? No profiteering then? As an American I would like to point out that what is characterized as "American Christmas traditions" are advertising creations that have very little to do with my Christmas celebrations for the last half century. As a country of immigrants there is no "American Christmas tradition" outside the media, and what you see on the tube is not what occurs in homes. In addition to individual family tradition [generally Swiss and Prussian in my case] there are regional differences [no holly in Florida, but the azaleas bloom]. Today is the feast of Saint Nicholas, which is the "gift day" for a lot of Americans, while many Catholic Americans will wait for January 6th [Epiphany / Dia de los Reyes], and Orthodox Americans have Christmas on January 7th. After working in Hong Kong, my younger brother and his family tend to have a British Christmas these days with crackers, Christmas pudding, etc. I completely agree with bryan! All of our neighbors have different nationalities, and backgrounds, and we all celebrate Christmas a little differently. I always found it interesting that a Communist country like China, and a largely non-Christian nation like Japan goes crazy for Santa Claus and Christmas decorating. I was going to give this thread a miss altogether, but I cannot resist engaging in a bit of stereotype-breaking. Bryan is absolutely right. Perhaps there are American households in which Christmas looks the way it does in the media and the advertising mailers, but most everyone I know has personal Christmas traditions instead. I enjoy a traditional Christmas dinner with friends. Our tradition for about 20 years has been to dine on sag paneer, Navratan korma, saffron rice, dal, yellow curry etc. at one or another local Indian restaurant. The tradition extends back long enough that my late father and other now departed parents participated. In this same circle of friends, we agree to limit our store-bought gifts to $20. Homemade gifts, baked goods, personal favors and donations to charity in one another's name are of course unlimited. And one may give a friend a book or CD already in one's collection. The thing we exchange most of all is "tidings of comfort and joy." I suppose the purveyors of Christmas goods must be very disappointed in us. As the group contains musicians, over the years, many of us have been occupied playing services or performances on Dec. 25, so we've celebrated together on other days, depending on what was possible. Yes, we have a traditional American Christmas: we make it up as we go along, with many traditions to draw upon, and one of our own in the making. here Christmas begins with a cent> the traditional sytufed cabage scent. That is a week before Christmas. parsley, onions, the sour cabbage, women trying to serve the best, this is the most important day of the year for many. On Christmas eve, the same scent everywhere, that of cabbages and poppyseed-cakes late in the afternoon families gather, spinsters, lonely poeple invited, then the angel comes and brings the gifts...I think there are angels after all. I have seen them, they are beautiful, they smell of cabbages and cakes. They have a nostalgia scent after all, so I won't trade my angels for a Santa, ever. scent, damn. how materialistic I can be. Red as Tom Lehrer said, "on xmas day you cant be sore, your fellow man you must adore, there's time to rob them all the more, the other three hundred and sixty four"
Bryan, This does not surprise me. The generic xmas is of course a construct. The main irriataion is when the construct supplants other traditions. but ultimately it is up to the individual and vive la difference.. Crackers and xmas pud? I love the latter but not the former! Again vive la diference EWBL. THat I like to hear. I was hoping hte Japanese would have the Xmas present robot they had in an episode of the Simpsons! I am impressed that a not particularly serious comment has had quite a response! Now your xmans is one to go for Steve. And an xmas dinner to really go for! It's settled, I wanna party with redwine and steve bates this Christmas! The food sounds delicious enough to keep my conservative mouth shut and out of politic talk trouble! Excellent choice. both sound good eh? The reason the American Santa is dressed in red and white is that early in the 20th century, Coca-Cola decided to do a Christmas advertising poster campaign and - you guessed it - dressed the Santa in Coca-Cola colours. It was a very popular campaign and the rest is history! There you go Snowflake.. Hmm my parents being Irish used to talk about Santy, now there is a Santa who should go back to wearing green! Thanks for the heads up to this story Jams, hope you don’t mind linking to it. A few years ago a Japanese department store, desperate to appear Westernised (and perhaps emulate Western sales-figures around Christmas), mounted an extravagant Christmas display, featuring a life-sized Santa Claus, crucified on the cross. Od hear.. I may grumble about americanisatin but I wouldnt want Santa crucified!! !